one comes with centre lock wheels and Ceramic Brakes (PCCB) but they cost a lot to replace? I want to drive and use the car and getting ceramic disk chipped could cost me a packet? does the centre lock wheels reduce my wheel choice? Ceramic discs cost a lot .. they used to be about £2k per disc but i think they are lower than that now . If you dont track the car then they pretty much last forever .. i dont recall changeing some for wear and tear since they first came out . They get chipped when people remove the wheel but dont use the correct tool for removeing the wheel .. the wheel can drop and touch the disc .. it doesnt take much to damage one that way . Other than that they dont chip . Pretty dam good at stopping the car as well . Center lock .. hmm .. if you get any tyres changed and its not a Porsche garage then make dam sure they do them up tight enough. I worked on a car several years ago that had tyres replaced at a fast fit .. nut not tight enough .. wreaked 2 wheels and 3 hubs .. dam expensive repair that was . I was quoted more like 4K per disc from Porsche, so yes expensive, set of pads fitted is about £650. If you happened to be unlucky and damaged a disc I would go the refurbish route at approx £1K per disc. Overall the PCCBs worry people but given the discs should last 150K miles and pads 40K+ I think they will cost no more over steel over the life of the car...... unless you are big into track days in which case as Dermot said I would stick with steel. CLs will limit your choice of wheels to CLs and it is not possible to use spacers with them. Regarding tyres, many OPCs will price match online prices or you can supply and they will fit. Not sure if they will fit non N rated.......... guess I will find out when I need another pair of MSS. I think we can safely say i was very wrong about the cost as ive just looked it up ..
Ouch is all i can say ! I had a conversation with an owner who put his car into an OPC for a warranty check and they found cracks in the PCCB's so advised that they needed replacing. He came away over £20k worse off, he had done one track day but as he said they're on a supercar so should be able to take a bit of heat! Even paying top dollar you can get a set of steel discs and pads for under a grand! there are steel replacements for these but this scares me, well really the wife moaning about a 20K car service bill! if you dont track these cars then they really are very good .. they last forever as do the pads .. they stop on a dime . You just have to be sensible with them .. i would recomend them over standard brakes any day of the week ! What are the chances that all 4 get chipped or develop cracks? The other option is to replace with steel and put the ceramics in a box until you sell the car. The original view of 20k to replace is a bit wild, I'm certainly more relaxed about it now having seen that there are options. Yep. They're desirable so if you're not paying much of a premium then swap them for some new steel brakes and enjoy those, knowing that you can put the PCCB's back on when you need to sell the car. You could even consider selling them to a member on here, I imagine that'd give you a bit of a return of some of your investment if you're that way inclined. I think you’re worrying too much about them. Both my Porsches have PCCBs and they are great. In fact I’d really like to only have cars with them now. Not that wild. It is ~£15k for the disks, another grand or so for the pads and several hundred more for anti-rattle shims, replacement calliper bolts and pad wear sensors. Then OPC labour. And don't forget VAT. The standard answer to the 'how much' question used to be 'about the same as a new Ford Focus', and it is still the same ball park. Decent steel racing disks with bells are in the £2-3.5k range for a set of 4 though OE Cup disks (which have a somewhat shorter lifespan for track use due to their propensity for thermal stress cracks around their vent holes) from the motorsport catalogue can be obtained for less. Other than steel or refurbishing your PCCBs there is actually a third option too. Surface Transforms make a composite disk that can replace PCCBs - it is a different kind of rotor the the Porsche ceramics and JZM supply them. Not cheap (I seem to recall them being around £8k for the kit including pads but not positive and it may have since changed as that was a couple of years ago), but appreciably less than PCCBs. 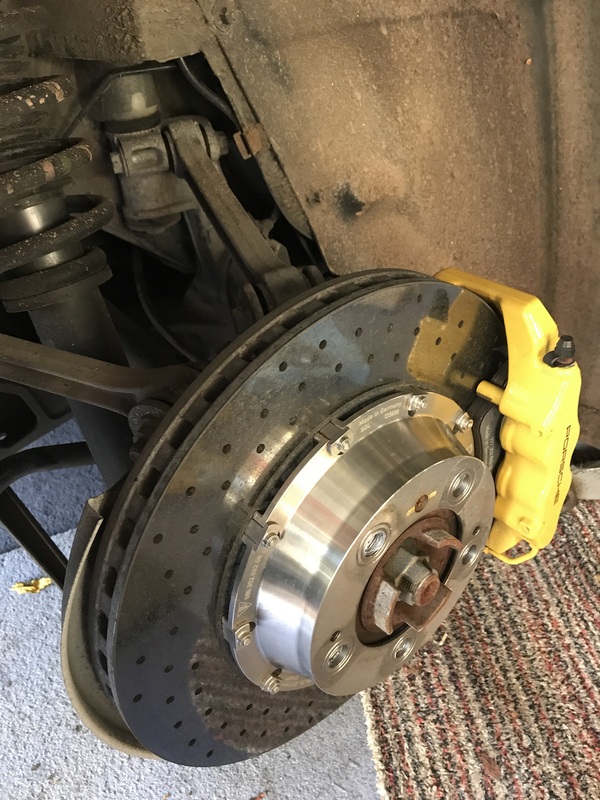 IF it is a great car take them off and store/sell them and fit regular brakes. I've got a 977.1 Targa 4S with PCCB's, it's done 67k miles and the PCCB's look like new. I took the wheels off to measure the disc thinkness (digital micrometer, Mitutoyo) and it looked like the rear discs were half way through there thickness, there's a min thickness on the disc. Also there are 3 wear discs that look like new. Fronts are less worn than the rears? Anyway, after getting paranoid about the replacement cost, if I do 5kmiles per year that's 12 years before replacements - I don't track the car. They work perfect from cold and don't make any noises. To make the discs last longer pads should be replaced before they wear out. Mine were at 80% left at 50k miles, measure by OPC. I'm just going to use them and work out what's next when the do expire. I spoke the guys at Surface Transforms, their discs can be recoated at little cost, but £4k/axle. Steels are another option with yellow calipers? Maybe the cost of the carbon discs will have come down in 2027 when they need replaced? A GT3 with PCCB's has just turned my head. I knew the discs were expensive, I thought 10K for the lot??? Even with "man maths" I'm never going to convince SWMBO of the merits of PCCB!